- Computers in Clinical Laboratories by Josep M. Queraltó et al. - Functional Foods: Reflections on an Expanding Market by A. Monge et al. - Le VIM Nouveau Est Arrivé! Cover photo: A plastic organic transistor that can operate under water and detect trace amounts of organic polluting chemicals. Image courtesy of Zhenan Bao, Stanford University. 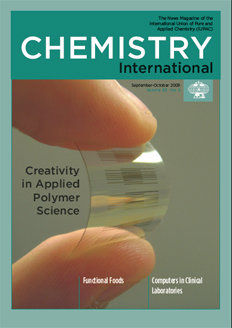 See related feature “Creativity in Applied Polymer Science." Page last modified 23 September 2008.